SNAKES ON A PLANE - Everything you have heard is true. This is badly written, badly acted, (and the cgi aint that great either!) but it is thoroughly entertaining... sort of like a car crash... so bad you just can't help but look, and stare, and look away but keep peeping through your fingers... Samuel L Jackson delivers a truly unique performance and, I guess, the best way I can describe this one is "a pantomime for adults". MIAMI VICE - After sitting through an extremely confusing and very expensive looking film I felt very dissatisfied. Fair enough, Michael Mann directed the TV series and so he can do what he wants with the movie. Unfortunately, there was no chemistry between the two leads (and wasn't that the key to the success of the series?) and no real anything. A few standard gunfights, chases, lots of confusing (and mumbled) dialogue but why bother calling it Miami Vice? A real non-event as far as I was concerned. THANK YOU FOR SMOKING - A very clever, altogether too long, jet black comedy. A great satire on the way that things get done in a capitalist society. It's a very well written, well acted, and well made film that you can enjoy but also hate at the same time. 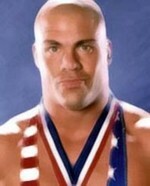 (Rob Lowe's character is especially great in this regard). A bit of trivia, even though this film is 100% about smoking, no-one actually smokes in the entire film. STORMBREAKER - This British junior James Bond is a real gem! We saw it in a little family run cinema in the British town of Keswick and it was thoroughly entertaining, well acted and a perfect film for kids who enjoyed the Spy Kids series, (but it my opinion it's far superior). It's the first film in a series based on the popular 'Alex Rider' books (which I've never heard of before) and it's scheduled to come out here in mid September. Grab some kids and go see this one, I think you'll really enjoy it. RV - Eddie Williams, Ice Cube, Vin Diesel, Steve Martin have all sold their souls to act in terrible "family comedies" and this Robin Williams effort is just as bad (and just as big a hit at the box office) as all the others. Robin Williams doesn't even appear to try to act in this film. It looks like every time the director yelled "Cut!" Robin said, "Great, let's go straight on to the next shot..." Unbelievably, the budget for this thing was $65,000,000 (twice that of Snakes On A Plane, and a third more than Stormbreaker's $40,000,000). Where did it go? Certainly not on the screen. Maybe little kids like this sort of a film, but I really could live a happy and fulfilling life without having to see and "toilet explodes and contents cover funny man" joke. THE LAKE HOUSE - I was really surprised by this one. I truly expected it to be pretty bad but strangely enough I got thoroughly sucked in by it's quirky story. The chemistry between Keanu Reeves and Sandra Bullock is excellent, and though it's essentially a chick-flick the "separated by time" device will keep the guys in the audience happy too. There's an especially "buzzy" moment when they take a walk "together" but two years apart (I'm talking about the grafitti). It's a remake of a Korean film Siworae but it's just such a great plot device it was worth remaking. JINDABYNE - I'll admit, I didn't watch it. Sue-Anne watched it on the plane heading over to FISM. My Mum and Dad saw it while we were away. General consensus: Slow. THE WRONG MAN - I prefer it's US title 'Lucky Number Slevin' but here in Aus it's called 'The Wrong Man'... how exciting... It's slick, beautifully written, well acted and shot in a very creative way... but the only thing stopping it from being another 'Usual Suspects' or even 'Inside Man' is that it tries too hard to be cool. Definitely worth a look though. KENNY - This came out of the blue! A low budget Aussie mocumentary about a bloke who delivers porta-loos for a living. It's success rests entirely on the appeal of the title character who is thoroughly loveable. Sue-Anne and I were discussing why most Aussie films are boring to watch, and we came to the conclusion that they mainly featured flawed characters the audience can't get behind. As a result, we don't care if they fail or succeed. Not so with Kenny! When the movie is over, you want to find out what happens to him next. As far as the film itself goes though, it's shot cheaply and looks cheap (well, it's supposed to be a documentary...) but it gets really boring in the middle when there's really nothing happening at all (I think both Sue-Anne and I nodded off at exactly the same time. We still don't know how he ended up on the plane!) But the movie really shines when things start happening and Kenny takes control. BASIC INSTINCT 2 - Hmmm. Do I really need to say anything here? I watched it on the plane and I just don't understand how so many people (both cast and crew) can get a film so wrong and still have the nerve to inflict it on paying cinema-goers. 16 BLOCKS - Bruce Willis at a completely different pace... and I liked it! A cop thriller with a very original plot that really keeps you on the edge of your seat after a very slow and intentionally dismal opening sequence. Bruce's character really grows on you, even the motor-mouth witness he's protecting (Mos Def) gradually becomes appealling. It's transformations like that that really make a movie worth watching. The other appeal of '16 Blocks' are the many "How are they going to get out that??" situations they get into. A good flick. CANDY - On the plane 'video on demand' is a wonderful thing. I fast forwarded through the first 50 minutes of this thing then I just pressed 'stop' and watched something else. Here's another FISM 2006 Competition report I came across. Just the close up acts, but very interesting coments nevertheless. "First of all, This letter is a commercial correspondence, for the inconvenience that you bring, I feel sorry deeply." After a telemarketer called at 8.45am this morning asking to speak to "the manager", I was in the mood to give him a serve when he called back later in the day. TELE: "Hello, I'm calling from Stevens Conculting and I'd just like to check on some details of your business. Is this Ellis & Webster Magicians?" TIM: "Is that Stevens Consulting from Armadale?" TELE: "Ummm no.. Can I just check on your details.."
TIM: "Where are you from then?" TELE: "We are in Melbourne." TIM: "Armadale is a suburb of Melbourne." TELE: "We are all over Melbourne, we produce a business directory that covers all of Melbourne and I.."
TIM: "Can I just check then, what street in Melbourne are you in?" TELE: "I'm not authorised to give out that information." www.greatozscapes.com.au send us spam faxes pretty much anytime our internet is off and it frees up our fax line. At the bottom of each spam fax they offer 'To be removed from our fax database please call 1300 139 302'. I have called them and left details requesting to be removed, but they keep sending the faxes. Sue-Anne has called and left details requesting to be removed, but they keep sending faxes. Coincidentally the content of the faxes seems to be identical to those we were receiving from www.getawaysdownunder.com and that odd Victourism company; One-day offers of 'Getaway Packages' to Bright or Daylesford. I wish they would give me their fax number too because I have a wonderful get away offer for them! This is a new form of entertainment created specifically for the corporate market. Guests arrived for pre-dinner drinks and were met by the acclaimed Hollywood director 'Cecil B D'Star' and his film crew (Ben) complete with lights, cameras, and an 8ft high 'Green Screen'. Guests were grabbed at random and asked to stand in front of the green screen and count from one to ten. Others were given hats or jackets and told to pose around the room. Some even got to act out spectacular death scenes! No-one had the faintest idea of what was going on but they were caught up in the excitement of movie-making and they all participated and had a whole heap of fun! But it didn't end there. While they went inside and enjoyed their dinner, Ben started a frantic session of editing and, just after main course, Cecil jumped up on stage to introduce the World Premiere of a brand new "James Bond Style" movie starring 'Jake Long' and featuring performances by all of the guests. You can imagine the hilarity as the guests saw themselves starring in the 8 minute movie, acting out situations that they hadn't dreamed of. Thanks to Ben's editing and Mat Unwin's character voices, Jake Long battled Gold Finger Pricker (a customised villain to suit our client, the Diabetes Society) and his henchmen while getting the girl and saving the day. People who were asked to wear white costs and hold glasses of water suddenly saw themselves as scientists in a fully equipped lab. A couple who were asked to hold hands and walk on the spot saw themselves strolling down a beach at sunset. One man even ended up on screen with the body of a bikini babe flirting with Jake Long! It was a hugely successful debut and Hollywood: Live! is now available for your event, Australia-wide. Your guests not only get to be the stars of a blockbuster Hollywood movie, but they get to take home a DVD of their adventures at the end of the night! Call Magic Unlimited now on (03) 9486 4445 to have Hollywood:Live! at your next event. I've been in email conversation with David Haverstat about his recent release the 'CSI Card Trick'. As many of you have pointed out to me, this is EXTREMELY similar to one of the effects in Sue-Anne's trick 'BLACK LIGHT'. 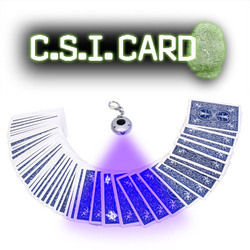 Quoting David Regal from the Genii Review of 'Black Light' in January 2006 "My favorite of the effects, called "CSI", is one where the magician uses the light to locate a spectator’s selection, and the spectators fingerprints begin to glow on one card only – their card. I like this so much because the use of the light is particularly organic." CSI Trick description: "A card is selected, returned to the deck and shuffled. The entertainer explains how this card will be located by using the technologies of forensic science. "You selected one card, therefore your DNA/fingerprints can be found on ONE card in this deck." Cards are spread face down and the entertainer proceeds to take out a miniature UV light. "I'm sure you've seen a number of the latest crime scene and investigation forensic shows. They use luminal to detect blood, and a device like this one to see fingerprints and fibers." The light is turned on and waved over the deck, suddenly glowing images and smudge marks can be seen on one card only. The card is turned over and it turns out to the spectator's selected card!" With Sue-Anne's 'Black Light' you get SEVEN TRICKS and CSI is just one. With Sue-Anne's CSI effect the spectator sees actual fingerprints on their selected card, with David's CSI effect they see "strange marks". In my emails with David he said: "You are claiming your example of the effect was thought up before mine -- I don't necessarily believe that is so." released a few card effects and had cards silk screened. I began to experiment with the UV inks and through testing found an ink that glows blue when a Black light is applied. However, the trick was not practical until the LED key chain light came out. Before that time there was a hand held black light that would be used. So to answer your question I was unaware that someone else has used a UV -ink to apply to various surfaces including cards and called it CSI. It is a standard term and you think of it with fingerprints. I have seen a company selling an effect where you right the name of a predicated card on the arm with invisible ink. With that said, I and most likely other conjurers, thought of using "invisible Ink / UV" for the use in magic long ago." As I said to David, Sue-Anne's effect was developed over three years ago. She sold it to Penguin Magic in August 2003 who had it for about eight months but were unable to mass produce it effectively. (They couldn't print the fingerprints, the pips, or the messages on the cards using stamps or machinery without blurring them or dissolving the stamps). Sue-Anne reclaimed the rights to the trick and has been producing every set by hand since March 2005. It's a pity David didn't do his research to see if there was a similar trick already on the market before releasing his. He may have read about it on the internet (several threads on The Magic Cafe in 2005 for example), plus Penguin advertised it and had a video demo on it on their site, seen it performed and sold at our lectures across the USA and at various conventions, and it is also advertised on all of our DVDS and, if he read Linking Ring and Genii he would have seen it reviewed in both magazines in January this year. So the question is... does CSI belong in 'Magic Fakers' ? M eets 2 weeks, Saturday 12:00 for 2 hours. Learning How To Find Things --- Starting With Looking In The Right Places And Not Turning The House Upside Down While Screaming. Like lots of children I was fascinated by magic. I’d watch illusions on TV and wish I could do them. I used to sit for ages looking at a pencil on the table hoping I could make it move. But there really wasn’t a place to learn. And back then it was pretty much all boys. Even now there are very few female magicians in the world, and even fewer in Australia. I didn’t see a magic trick done live until I was 22 and studying art with a teacher who was also a puppeteer and a magician. He showed me a trick and I knew I had to learn how to do it. But before he’d teach me anything he gave me a pile of books to read. Magic takes a different kind of aptitude. It attracts a lot of people in the science fields, I was a science freak, but by then I’d moved towards drama and the creative arts. Both helped me. When I started performing magic, drama lessons helped me because it’s not just about performing illusions. You need to know about being on stage and keeping the audience interested. You have to magic something magic without making people feel foolish. My husband, Tim Ellis, has been a magician all his life. We met at a magic conference in Sydney where he put as much energy into getting me up on stage as I put in avoiding it. I was terrified, but it was great fun. After the conference he went home to Melbourne and we agreed to keep in touch. A week later we were talking about getting married! I moved to Melbourne and we started working together. Now we do magic shows and one-on-one magic for corporate events. We have different approaches to our profession, so working together can be challenging. And that’s one of the reasons I love going to Fernwood – it’s a great outlet for my frustrations! I also need to be fit for my illusions. I get squashed and levitated, and have to escape from a straitjacket. I also cut my husband in half with a chainsaw. I think I’m the only female magician in the world who does the sawing act – it definitely requires some strength. And then there’s my character, Jeannie. When we did one-on-one performances I used to get very nervous. Friends suggested getting into a character, so I started dressing up as Jeannie, from TV’s I Dream of Jeannie. Everyone expects her to do magic so it makes it much easier, but the outfit does put pressure on me to keep my upper body looking good!